The PV 118 Sub is a compact vented subwoofer system utilizing an 18" heavy duty woofer with a 3" voice coil and a 65 oz. magnet. The black, perforated steel grille and steel corners provide protection and a professional appearance, and the sturdy steel handles allow for ease of transport. A top pole mount for 1-3/8" stand poles is incorporated, and two 1/4" phone jacks are connected in parallel for daisy chaining or to send a full-range signal to a P.A. cabinet. 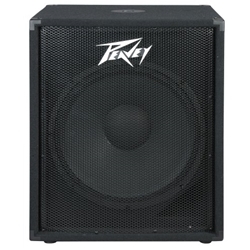 The impressive 400 Watt program power rating allows for plenty of gut pounding bass. The internal lowpass crossover network, along with the vented enclosure, provides great bass response that will add the thump you desire.